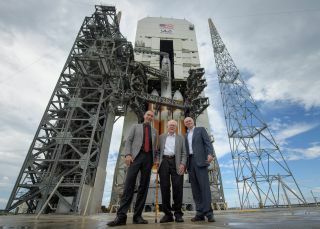 NASA Science Mission Directorate Associate Administrator Thomas Zurbuchen, solar astrophysicist Eugene Parker and United Launch Alliance President Tory Bruno in front of the rocket that will carry the Parker Solar Probe into space. It's never too late to do something for the first time — especially if that thing is seeing a rocket launch in person, and even more so if that rocket is carrying a mission named after you. At 91, renowned solar scientist Eugene Parker is experiencing just that this weekend as NASA launches its Parker Solar Probe, a seven-year, $1.5 billion mission to "touch the sun." Parker, now retired from the University of Chicago, spent his career trying to understand the sun and the ways it affects the solar system. In 1958, he hypothesized the existence of the solar wind, the constant rush of highly charged particles that constantly streams off the sun. And now, six decades later, a spacecraft that will revolutionize our understanding of the phenomenon is prepared to launch. Since the mission was named in his honor last year, NASA has offered Parker special behind-the-scenes access to the spacecraft carrying his name. He previously toured the facility where the spacecraft was built, and now he is in Florida, visiting NASA's Kennedy Space Center. Parker also received a tour of Kennedy Space Center. Today (Aug. 10), accompanied by NASA Science Mission Directorate Associate Administrator Thomas Zurbuchen, project scientist Nicola Fox of Johns Hopkins University, and United Launch Alliance President Tory Bruno, Parker admired the Delta IV Heavy rocket with the probe in its tip. The spacecraft is currently scheduled to launch tomorrow (Aug. 11) at 3:33 a.m. (0733 GMT). Parker has never seen a launch in person before. We can't offer quite the same experience, but you can watch the launch live here on Space.com, courtesy of NASA TV; the broadcast begins at 3 a.m. EDT (0700 GMT).